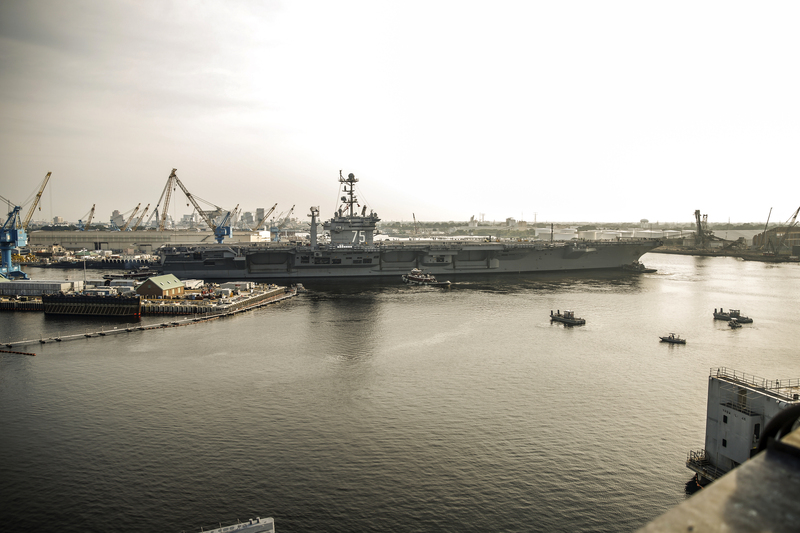 WASHINGTON NAVY YARD – The Navy will rely more on private industry to help with aircraft carrier and submarine maintenance work at public shipyards, as the service seeks to keep up with growing maintenance needs and awaits a much-needed public shipyard renovation effort. 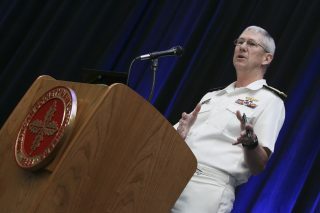 Commander of Naval Sea Systems Command (NAVSEA) Vice Adm. Tom Moore told USNI News that he wants to give smaller repair companies a more predictable stream of work farther in advance, instead of only contracting out work once the public yards have maxed out their overtime hours and cannot complete an availability on time. “A lot of the smaller yards will help us with things like tank work and non-skid, et cetera. What I would like to do on the public side of the house is, we contract work out on almost every availability that’s done in the public sector – both submarines and carriers – we contract some work out to the private sector. Our practice has typically been to wait until close to the availability’s ready to start to determine whether I have the capacity in the public yard or not. I hold on to that work as long as I can, and then we tend to, when we don’t have the capacity in the end, we give it to them kind of late in the game. It’s not a great way of doing it,” Moore explained in a Dec. 18 interview. Moore said the Navy relies on large shipbuilders such as General Dynamics Electric Boat and Huntington Ingalls Industries’ Newport News Shipbuilding to help with certain aspects of submarine repairs – and in some cases to take on entire maintenance availabilities, as the Navy has faced major backlogs at the yards and hasn’t been able to keep its attack sub maintenance availabilities on schedule due to lack of resources. But handing more work over to smaller companies who may specialize in one aspect of a maintenance availability will not only help keep the work on schedule but will also free up the naval shipyard workforce to focus on bigger-picture issues or on components of the subs and carriers that cannot be contracted out. Acknowledging this up front and letting companies bid on work well in advance will help these contractors and may also help the Navy save money compared to last-minute bids. “I understand the pride and ownership of the naval shipyards, but I think there’s an opportunity for us here to provide some stability to the private sector and then actually provide us a little more stability in the public yards to focus on the key work we need to get done,” Moore said. Moore said NAVSEA’s logistics, maintenance and industrial operations (SEA 04) office is already working with the public yards to come up with a strategy for identifying and contracting this work ahead of a ship coming into a public shipyard for a maintenance availability. As for larger shipbuilding companies, Moore said he expects to see them continue helping with pieces of availabilities and taking on entire availabilities as needed to help smooth out workloads at both the private and public yards. “We have an ongoing work with both [Electric Boat] and Newport News to support us on availabilities that are going on in the shipyards – Newport News Shipbuilding provides us a significant amount of work on almost every one of our carrier availabilities that are accomplished in the public shipyards because they’re quite good at certain areas. And so we often will need capacity from them – it may be a couple hundred thousand man days, so it’s not the entire availability, but we’re seeing more and more where they’ll send a team to Puget or send a team to Norfolk to support us,” Moore said. Also during the interview, Moore said the Navy is looking at ways to incentivize private repair yards to invest in additional capability, and especially in more drydocks, to accommodate growing surface ship maintenance needs. 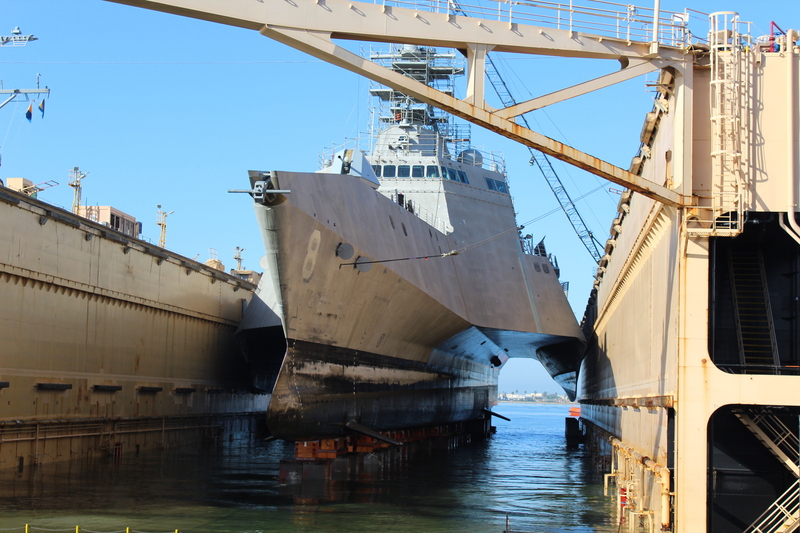 Today’s fleet already requires more drydocks than before – the Independence-variant Littoral Combat Ships (LCS-2) require a drydock for almost any maintenance activity – and a larger fleet going forward will only require more drydocks. Moore said industry is looking for stable workloads as a precursor to spending money on major capital improvements. With maintenance and repair work coming out of the operations and maintenance budget – with money that expires at the end of the fiscal year, unlike shipbuilding money that can be saved and spent in a later year – creating that stability and incentivizing repair yards to invest is a challenge. The Navy has paid part of the cost of upgrading shipbuilding yards in the past, Moore noted.